A good deed (and a great gift) remain unforgettable. By John Rampton . Entrepreneur and investor @johnrampton . PUBLISHED ONinc.com: NOV 24, 2017 . Link to article here. In 1985, one of the poorest countries in the world became known as one of the most generous. Despite nearly 50% of its population living below the poverty line the Ethiopian Red Cross sent $5,000 to Mexico for humanitarian aid. Our neighbors-to-the-south had experienced an 8.1 magnitude earthquake which left 10,000 people dead, 30,000 people injured, and 250,000 homeless. When asked how they could afford such an amount, the proud Ethiopians pointed to 50 years earlier when their country had been had been invaded by Italy. Mexican diplomats, in a move akin to sticking up for the little guy against the school yard bully, deeplycondemned Italy’s behavior. This support would set forth a chain-of-events that would allow the impoverished East African country to remain in the league-of-nations. Decades after-the-fact, a good deed (and a great gift) remain unforgettable. GIFT MARKETING: GIVE TO GET? Ironically enough, I don’t remember where I was the first time I heard that story. But I remember who I was with the day the proverbial “Aha!” lightbulb flashed above my head with corporate gifting. His name is John Ruhlin and his company, The Ruhlin Group might very well be the greatest gift-givers in the galaxy. Practical luxuries: buy things for people they’d never buy for themselves. A $50 coffee mug is better than a $100 watch. Personalized for the recipient: if the most remarkable thing about a gift is that your logo is on it? You’re giving a promotion, not a present. Plan for continuity: think of each gift as one in a cohesive series. This year send the leather belt, next time the leather bag, then the leather journal, etc. The majority of sweets, treats, and very forgettable holiday gifts (with your company logo etched on them) are all going to wind up in the trash. Or maybe in a donation bin if the recipient is feeling more imaginative than the unoriginal giver. Sold by the ambitious students of Vector Marketing, CUTCO cutlery has been an American-made tradition since 1949. All Cutco items are guaranteed forever and, with over 100 products in their line, are the ultimate continuity gift. You can even engrave the ice cream scoop. Planners, journals, flasks, candles, phone cases, coasters, and anything else that can be made of wood. The beauty of these products (all 100% engravable) is rivaled only by the custom packaging– gifting done right. And every single purchase plants a tree with their “buy one, plant one” program. Who wouldn’t want a pair of zebra wood headphones? Buy them wired, wireless, or in speaker form and send your VIPs to audio heaven. Best of all, proceeds from every sale provide hearing aids to people in need. Check and mate. Stunning glassware and home decor made from recycled wine bottles, one look at Refresh’s Instagram account will have you oohing and ahhing. Their custom engraved setswill delight connoisseurs and socialites alike. What’s better than a cooler that’ll keep ice for a week or more? How about one of the best warranties in the industry that covers latches, drain plugs, handles, even the rubber feet. Like most practical luxuries on this list, high-quality isn’t cheap. However, Bison Coolers boasts gifts for all different price points. Disrupting the digital framing industry, Aura Frames curate and display your favorite photos as you take them. Sensors in the frame automatically adjust brightness at varying times of day and the mobile app allows others to participate. Shop different collections and different occasions because every frame is a work of art. My secret go-to for my hardest to buy VIPs, Cherokee and Texas can do anything with leather and metal. Their vintage iPad covers will become frequent conversation topics and their custom record player is the stuff of legends. Better get in line soon because -with their craftsmanship and ingenuity- this company won’t be a secret much longer. Whether you have a green thumb or have a hard time keeping plants alive, the self watering planters are a fantastic way for you keep a beautiful garden indoors. The best part about these eco-friendly planters is that they are self-watering and can keep plants hydrated for up to 2 weeks. Since they are self-watering they work best with plant varieties that like constantly wet soil. We highly recommend tropical and African violets. Some herbs like Basil do well but others like to go dry between watering. Please make sure that you check to see which like constantly moist soil before planting. The Refresh Glass Planters are made from wine bottles we rescue with the help of our collection partners in our local community. Refresh Glass has a mission to rescue over 10 Million Bottles and have a counter the website showing the current count at refreshglass.com. They are made from a wine bottle that was diverted from a trashy future. All of the packaging is cleverly used in the construction of the planter = 0 waste! The plant consumed carbon dioxide and creates oxygen. There is a string that extends between the top half that holds the bottom plant and the bottom half that holds the water. The water wicks up the string to bring the soil to its natural saturation point and hydrate the plant with yummy water for up to 2 weeks. Here is how to make the Refresh Glass Wine Bottle Planters step by step. You can follow along with Ray DelMuro and his Grandma Lorraine as seen on this instructional You Tube video as well. Link to how to make the Refresh Planter video. Follow along with the steps below and make one of your own! Purchase your planter online at refreshglass.com and a 4” plant of your choosing from your local plant seller. We recommend a golden pothos for first timers. They look great and are super easy to maintain. The two halves of the bottle. Put the rubber grommets around the top of the bottom half of the bottle at 12, 3, 6, 9 o’clock. Fold the tape over 2x so it is ¼ its original size. Then double knot the string around the center of the tape so that there is about 1” left on the short end. Fold the cone along the three crease lines and make it into a cone as shown above. Then place the circle sticker over the grey circle to hold it together. Place the long end of the string, down, first through the cone opening from the top, and then through the screen. This will create the stopper and water transfer system to keep your new planter in the top half and healthy over time. Place the long end of the cone and string assembly in the top half of the bottle as shown and lightly pull down on the string to help center it in the glass. Using a large bowl, loosen the soil off of the plant root ball as shown above. Cover the cone with soil first. Then when you can no longer see the white inner cone, place the plant root ball on top of it. Next pack the soil evenly around the roots and pack the soil down with moderate finger pressure. Stop when the soil is about ½” from the top rim. Remove the top half with the plant from the glass and fill the glass 2/3 full with water then place the top half back in the glass so that it sits centered. Your new indoor garden lives! BAM, you did it! Enjoy your new Refresh Glass self-watering planter for years to come. We hope you enjoyed these suggestions and that they work amazingly in your home or make you look good to those you are gifting to, bring them years of enjoyment, and make both parties proud to be part of the 10 Million Bottle Rescue Mission. See the live counter of how many bottles have been rescued by the team at refreshglass.com. Subscribe here to see their latest and greatest products. Why is it so hard to find the best housewarming gift that is truly unique and something people will actually use? I’ve had experiences where I go to a big box retailer and am roaming though the isles looking left and right just saying to myself nope these options are all too boring (to the point where I am about to be late, if I’m not late already). I’ve compiled the top housewarming gifts from Refresh Glass to give you gift ideas and reduce some of the stress of shopping for the perfect gift. All of the suggestions for gifts below are from Refresh Glass and are made from wine bottles as a part of their 10 Million Bottle Rescue Mission (to save wine bottles from landfills). All of the products are everyday usable, unique, and a fun story to tell and be a part of. A steal at super reasonable price points for cool products that are truly unique and that you won’t find in a shopping center. So much glass on the market is clear. This leaves no room to give that special pop to whatever surface you put it on. Wine bottles on the other hand come in different hues and have amazing earth tones that can complement almost any room. This vase is a great gift that will brighten up anyone’s new home. It’s a slam dunk for under $20. Hint: also great for Mothers Days, Valentine’s day gifts, and after you did or said something dumb (which doesn’t make you a bad person, but on occasion it happens). If you really messed up than make sure you bring this with flowers in it. Do you know a household with humble inhabitants who like to have a drink after dinner? If so these will be perfect! Ice spheres are popular in the whiskey belt and the punt (bump in the bottom) holds the ice ball elevated so the valuable and delicious contents will be chilled on the way out without being diluted. These are great conversation starters and a really unqiue way to share a drink with friends. These come with the ice ball molds that you can put in the freezer as part of the package. Can be ordered in a 2 or 4 pack. Hint: also perfect for a Father’s Day gift or for a Groom or Groomsman gift. Who has been over to a friend’s house and their glass cupboard in the kitchen looks like the hodge podge of glasses they got were either from Goodwill or inherited from a grandparent who didn’t want them anymore? Hey, these people got a new house so why not get them a house warming gift that their entire family will use, enjoy, and talk about all the time. With the set you get 12oz and 16oz glasses made from wine bottles in a quantity of 4 each. They also come in a mixture of colors. Every bottle has a slightly different feel to it in terms of the diameter, weight and rim thickness. Super safe around the little ones too since they are so sturdy and efficient to use since they are dishwasher safe. This one is a crowd pleaser and a great all around option. Hint: also great for a wedding gift of for someone who has glasses that are older than they are. Can withstand a college apartment too, but probably not a frat house, stick with plastic there. The glass rests on top of the carafe when not in use. The design is very sleek and elegant in addition to being super handy. This set is super diverse and can be used as a cocktail set in the kitchen or even as a water carafe! Many professionals use these at their desk for water and fill them up once in the morning and once at lunch and are good to go. Hint: They can also be purchased 2 at a time for a wedding gift, especially as a gift for those who like wine too! They need to hydrate… hangovers get worse as you get older. These are super cool and really popular. They are three times green since they are made from both halves of the wine bottle, all of the packaging is used in the construction of the planter, and the plant it holds consumes carbon dioxide and creates oxygen. Best part is that they look great either alone or in collections of odd numbers. The plants that work best in these bottles are tropical varieties, herbs, and African Violets, since they both like to be watered from the bottom and have constantly moist soil. Check out this video with Sun City Arizona celebrity Grandma Lorraine. She was selected as retirement community’s athlete of the year and also bakes some of the meanest monster cookies on the planet(… Earth). She makes amazing fresh squeezed OJ too. I didn’t include her last name on here because I didn’t want her to run out of OJ, call me selfish. Watch her and I putting together some Refresh Planters on this video here. She is a pro and has a plant that is over 4 years old in the same planter! 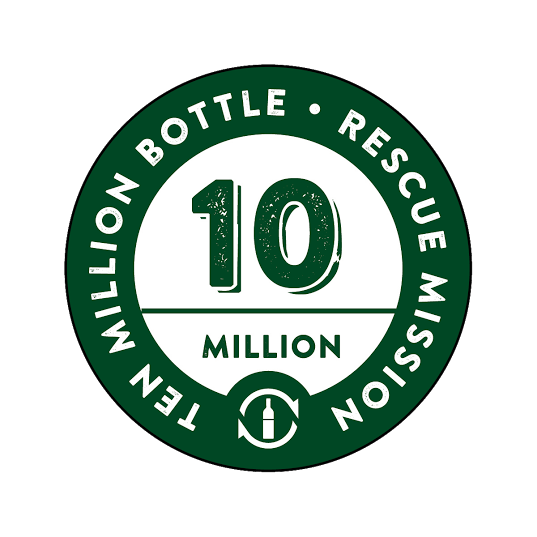 We hope you enjoyed these suggestions and that one or many of them make you look good to those you are gifting to, bring them years of enjoyment, and make both parties proud to be part of the 10 Million Bottle Rescue Mission. See the live counter of how many bottles have been rescued by the team at refreshglass.com. Happy Earth Day Foodies! I wanted to write a blog that was food based, topical and not preachy. There is so much negativity floating around the culinary world in regards to sustainability, GMOs, etc. I decided that I wanted to write about something positive and recently at Devoured Phoenix, Mister and I received some amazing glasses in our goodie bags that happened to fit that bill. It was perfect! The tumblers we received were from a local company called Refresh Glass. Refresh Glass, is based out of Phoenix, Az. They collect empty wine bottles from local restaurants and hotels who would have otherwise thrown them away. They then transform them into beautiful glassware. In 2015, Refresh has collected and repurposed over 600,000 bottles. Their mission is to grow to collect and repurpose over 10 million bottles per year. Owner Ray DelMuro grew up in Pasadena, California, and received his BS and MS in Industrial Technology at Cal Poly SLO. After school he worked as a manufacturing engineer for an aerospace company for 5 years before quitting and taking a year long trip around the world to try and figure out his passion profession. A year after his trip ended he launched Refresh Glass. In 2009, Ray was selected by the Arizona Republic as one of the Top 35 Male Entrepreneurs under the Age of 35 in the state of Arizona. In 2010 Refresh Glass was selected by the AZRC as the Small Business of the Year for Recycling in the state. Ray loves art and engineering and wanted to create a product that blended his favorite parts of both. To him, engineering has to do with function and utility; logic, quantifiable tests. This was his job as a manufacturing engineer, to ensure fit, form, and function. He was also responsible for establishing efficient processes by managing the variables of cost, quality, and time & still does this now. For Ray, the kicker is the art. Since he was a kid I he has always loved drawing and then that turned into a love for fabricating. The concept of taking a mechanical design, or art concept, on paper and then making it come to life is still fascinating to him. He believes that art has to do with designing for an emotional response; something that his glassware has had a strong track record of achieving. With Refresh Glass he wanted to create solutions where others benefit both financially and emotionally as a result of their pursuits. One of Ray’s best friends told him in late 2008, when he first started making the glasses out of his garage, that people want this project to succeed because they want to be able to say that they played some part in Refresh Glass’ success. Ray wants everyone who eats at a restaurant that collects for Refresh Glass, works there, sells, distributes, or has a set and tells his story to feel like they played an important part in helping our project grow, because he believes they have. He wants people to enjoy the elegance of the function and the feeling that the glasses represent. Refresh Glass has glasses being used at Wolfgang Puck, Four Seasons, Ritz Carlton locations in addition to many other restaurants and hotels around the country. Refresh products are also sold at many retailers in the states as well. Well foodies, that about does it for this blog! I hope you enjoyed learning about one of my favorite local companies. What we choose to buy matters and it’s great to support a company who not only shares your beliefs but creates a beautiful and functional product too! ­­­­­­­­­­­­­­­­­­More information about Refresh Glass is available at www.refreshglass.com. Until next time! Last month I attended an event in California. Our group enjoyed a great conference as well as many after-hour social events. Although the meeting was planned as environmentally conscious as possible, I noticed that the empty wine bottles of our events were thrown out with the trash. Hundreds, if not thousands of wine bottles must be disposed of monthly at the resort in that manner. A week or two later I crossed paths at a Conscious Capitalism workshop with Refresh Glass, a Phoenix-based company that collects thousands of empty wine bottles from the community a week, and repurposes those into functional products for everyday use. They recognized the need to repurpose these empties and created partnerships with many local restaurants and hotels to collect their empty wine bottles in the Phoenix area. As a planner I recognized a special synergy between an event and the repurposing of the event’s empty wine bottles. You can have bottles from their collections crafted into glasses with company or event logos, and gift them to speakers, attendees and VIPs post event. On a more intimate scale you can have special wine bottles repurposed into glasses for a newly married couple. Refresh Glass also offers glasses with chalkboard labels that can be used to indicate place settings at events. Bottles are also repurposed as vases and candleholders. Their products get animated responses because of people’s love for aesthetic and functional items that have a story, in addition to their love for wine. Each piece they create is truly unique and has its own personality. All of the bottles transformed by Refresh Glass are currently collected by businesses and individuals in the Phoenix, Arizona area. Ray DelMuro, Refresh Glass Founder and Owner established a goal for his company to rescue 10 million bottles, keep them out of landfills and repurpose them. Items to gift at events can be ordered online starting at $5. Custom projects are priced accordingly and usually take 7 to 10 days from order to delivery. There are no official numbers, but apparently there are a lot of wine drinkers in Phoenix. So, you can imagine how that could lead to quite a few empty bottles … maybe millions. That’s why Tempe-based Refresh Glass is on a 10-million bottle rescue mission and gaining national attention at the same time. They’re turning trash into something to be treasured. At Refresh Glass, workers collect thousands of empty wine bottles each week from restaurants and businesses across the Valley. Then they repurpose those empty bottles into items such as drinking glasses, planters, carafes and candleholders. The company also celebrates the uniqueness of each bottle and what each one represents. Across the country, people are taking notice of what’s happening at Refresh Glass and placing orders. “There’s so much potential,” Del Muro said. “We’re collecting a small fraction of all the bottles that are generated in the Valley. 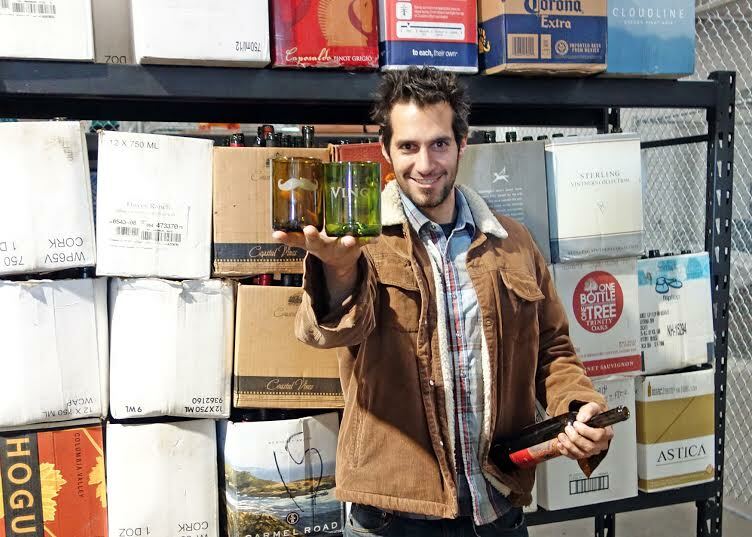 And to be able to make them into something functional that people can enjoy over and over again is a really awesome feeling.” Refresh Glass has collection sites for empty wine bottles at Whole Foods stores in Tempe and Chandler. Fact: glass makes up more than 5% of landfills. Fact: recycling one glass bottle saves enough energy to light a 100 watt bulb for six hours. With these facts in mind, Ray DelMuro’s mission is to recycle 10 million bottles, fashion them into saleable product, and improve the planet in the process. Ray DelMuro is a one-time aeronautical engineer who has found the perfect mediumto meld his left brain/right brain gifts. Refresh Glass, the company he founded in 2008, repurposes wine bottles into drinking glasses, carafes, vases, and candleholders saving 200,000 bottles from the landfill each year. Thus far, Refresh Glass has recycled more than 450,000 wine bottles on its way to its 10 million bottle rescue mission. “I wanted to find a solution to this problem and improve our planet while making something useful out of the bottles,” says DelMuro. The dishwasher-safe, highly durable assortments include five colors – green, gold, clear, antique, and amber (the most popular color perhaps because it’s the least expensive since there are so many amber bottles recycled). There are 75 SKUs – drinkware , carafes, vases, planters, soy candles – which retail from $15 to $40. DelMuro is bullish on business, his sights set on being a $20 million player by decade’s end. “Only people crazy enough to dream it get there,” he maintains. “And our product will get us there.” A promising partnership with Whole Foods – it starts locally where Refresh Glass enjoys a huge presence, with the intent of going national – as well as an innovative social media project where DelMuro posts on different product uses for a wine bottle’s parts (like trivets made out of corks) are outside-the-box projects that fuel DelMuro’s passion, a passion clearly palpable in his voice, which he so desperately desired. TEMPE, AZ–(Marketwired – Feb 18, 2014) – Refresh Glass, a Tempe, AZ based company that creates functional wine bottle art made from empties rescued from landfills is helping restaurants, hotels, and retailers generate revenue while contributing to their 10 Million Bottle Rescue Mission. Hotels and restaurants that use Refresh Glass products get enthusiastic responses from guests who recognize the wine bottles they know and love while increasing engagement with their staff. The repurposed wares also help broaden their sustainability programs that the public increasingly looks for every year. “The FireSky Resort and Spa is a very green conscious resort and we have been using Refresh Glasses in our event areas and guest rooms for over 3 years,” said Cheryl Martin, General Manager. “Our guests continually have animated responses to how fun and unique they are. We also sell their 4 packs in our gift shop which makes the glassware a great overall win for us. The partnership has been successful and I always look forward to what is coming next!” she continued. Restaurants have had created raving fans with similar guest responses like at the nationally acclaimed Husk Restaurant in Charleston, SC. “We have been using Refresh glassware since our inception in 2010. The 16 oz Amber glasses add rusticity to our contemporary dining room. The 12 oz antiques are used for our cocktails and bring a unique twist to our beverage program. Refresh glasses are sturdy and beautiful, in addition to being on the front lines of the fight against waste, making them a perfect choice for us here at Husk,” said Jennifer Bresnahan, Manager. Refresh Glass began in the garage of Ray DelMuro, a former aerospace engineer, in an effort to combine his passions for the function of engineering, the responses of art, and a great cause. The company now has gone from humble beginnings in the local farmers market to diverting over 15,000 empty wine bottles each month from local collection partners who would have otherwise thrown them away. The bottles are then transformed into functional products such as drinking glasses, candle holders, vases, planters and more. “We now sell to Wolfgang Puck, Four Seasons, Whole Foods Market and we ship all over the country. We create multifaceted win-win situations for our hospitality and wholesale partners. They make money for their businesses while supporting a greater cause,” said Ray DelMuro, founder and owner of Refresh Glass. Refresh Glass products can be found on their website. They also offer bulk pricing for hospitality venues and wholesale pricing for retailers. At its current pace, Refresh Glass anticipates hitting the half million mark in their rescue mission in early summer. While collections are solely from restaurant and hotel partners, there are plans developing for quarterly public bottle drives. Ray DelMuro has always known what he’s destined for. And it was. DelMuro’s glass making odyssey started back in 2008. DelMuro was working as a manufacturing engineer for a Southern California aerospace company when he started experimenting with empty wine bottles and a bottle-cutting kit. Determined, he sat for hours, sanding and cutting away until he had a functional piece of art. Eventually he figured it out and decided to take his experiment and turn it into a business. That same year, DelMuro launched Refresh Glass, a Phoenix-based company that recycles empty wine bottles, turning them into drinking glasses, vases and other works of art. “Refresh Glass has transformed a problem into an effective business model,” says DelMuro. And it has worked. Every month more than 10,000 wine bottles are recycled from area restaurants, bars and hotels. They are then cleaned, stocked by color, manufactured with custom built machinery and polished at a manufacturing facility in Tempe. 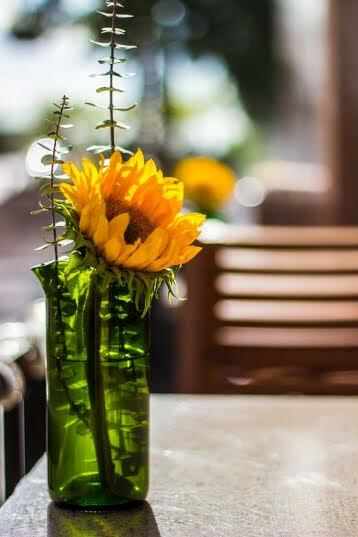 Today, Refresh Glass has recycled over 400,000 wine bottles and his products can be found online or at Valley establishments like Postino, Pizzeria Bianco, Hyatt Gainey Ranch, Phoenix Public Market and Practical Art. But their bottle rescue mission doesn’t stop there. According to DelMuro, Refresh Glass has big plans for 2014, thanks to a recent partnership with Valley grocery chain, Whole Foods. The program will start in Tempe and eventually run in all Valley Whole Food stores as well as those in the Southern Pacific United States. The popular grocery chain will sell DelMuro’s products as well. “From weddings to birthday parties, this kit will allow people to relive their most cherished memories,” says DelMuro. According to DelMuro there will be several different options that include various types of bottles and an etching option, all for under $500. 100% collected from the community, 0% bought from bottle manufacturers!